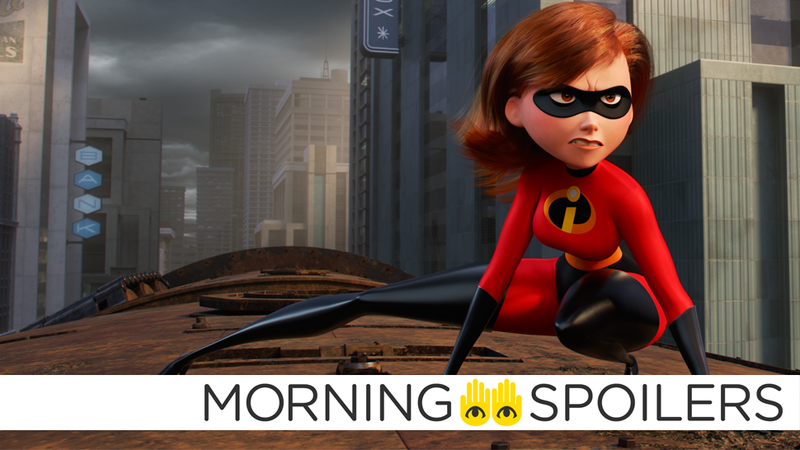 No one’s beyond Elastigirl’s reach in Incredibles 2. Nick Frost adds himself to the waiting list to play The Batman’s alleged main villain. We could be getting looks at Suspiria and Bumblebee very soon. Supergirl will take on an unlikely opponent in the season 3 finale. Plus, what’s to come on Syfy’s last two episodes of The Expanse, and more. Nick Frost is the latest to express interest in playing The Penguin on Twitter. Cinema Australia reports a sequel is already being planned for the upcoming aliens-invade-Australia film from director Luke Sparke. The Slender Man movie intended to hit theaters May 18th is now looking for a new distributor, according to Variety. The film’s official Twitter teased a trailer is coming next week—with an actual trailer! The first trailer arrives Tuesday, June 5 according to the Mexican TV channel Once Noticias. The Incredibles take on the Underminer in a new clip. Coming Soon also has the latest poster, which sees the family’s core unit silhouetted alongside Frozone and Jack-Jack’s raccoon. Coming Soon also has a poster for the latest How to Train Your Dragon film. In a new featurette, director J.A. Bayona and the cast discuss how empathy is at the heart of Jurassic World: Fallen Kingdom. The deal gives the company full rights to the 130 x one-hour series including all assets, audio, original screenplays, and most licensing and merchandising. The rights were acquired for an undisclosed amount from the show’s original producer, Mitch Markowitz, who will serve in the same capacity on a new version of the live-action show with Headspinner co-founders Michelle Melanson and Ken Cuperus, and Canadian actor Sandy Jobin-Bevans (Greenfields, Annedroids) as co-producers. Cuperus and Jobin-Bevans will also showrun. Spoiler TV has synopses for the final two episodes of Syfy’s incarnation of The Expanse. As survivors arrive to the Behemoth, two factions form over how to handle a life-or-death threat; Holden grapples with what he’s seen and the choices he must make. Finally, a behind-the-scenes video provides tons of new footage from season three.